It was another busy month here on our homestead. Summer is commonly thought of as the busiest time, but in reality, those weeks between the end of long sunny days and the falling of leaves is equally filled with necessary chores. We are still getting the rest of our wood in. This shouldn’t be so time consuming with so many hands to help an ample equipment on hand, but it sure has been. The weather has not exactly cooperated with our plans. It has either been super hot and humid for this time of year or raining for days and turning our 56-acres into a mud bog. 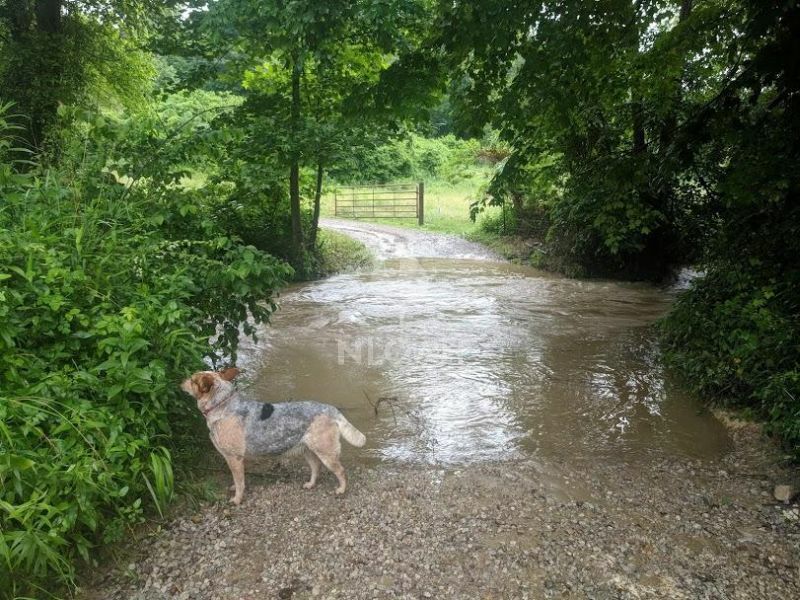 Our creek misbehaved several times over the past month and we are not even truly in the fall rainy season yet. While expanding a logging road back into our woods to chop and pack out trees that were cut in the spring so they could be split and stacked we got a brand new trackhoe stuck. And I mean STUCK. It took three days and the loan of a bulldozer to get it out – and then it would not run. Hopefully, the mud and water it got stuck in just as it was finished with the job and pulling out of the woods, appears to have ruined a filter and a starter but not the engine, that was a huge relief. We have also been working on fencing mending and adding fencing around the lower acreage so the herd can be rotated into it to eat in the late fall after the final hay cut. Oh, hay cutting, that has been joyous as well. Baling hay is a hot, hard, and scratchy job even when the baler doesn’t decide to have issue with tying the strings in their proper position and tight. My nephew Conner (screen right) is home from the Marines and getting a crash course in homesteading life. He has some country boy skills and a strong back, so his homesteading education is advancing quickly. My husband surprised me with six new ducklings this month – a way better gift than red roses for a homesteading gal. They are Pekins, which are my favorite breed. They are a meat duck, but I keep them just for the sheer joy of it and their deliciously rich eggs. If you have never baked with duck eggs, you surely should give it a try, but remember to adjust down the amounts because duck eggs are both larger than chicken eggs and have a stronger taste…but a good one. The ducklings and Buckeye chickens it took me two years to find (If, I actually wanted some raised in Ohio, that is) are now living in harmony together in the coop and run. This photo was taken in the outside brooder where I put them to get acquainted to see how the two little flocks would adjust to each other. 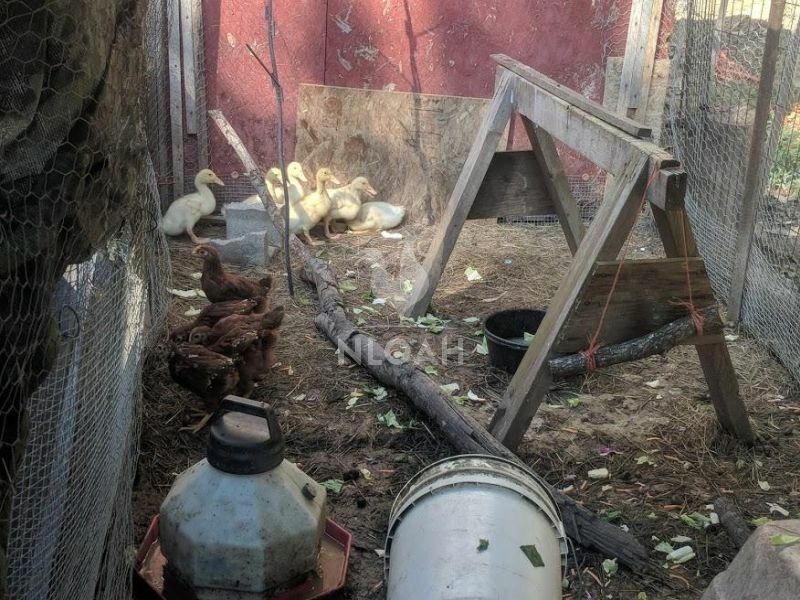 I have always had great luck intermingling my chickens, ducks, and guineas as long as they are raised together from a young age and then free range together. The grandkiddos and I have been going nut hunting almost every evening. They are learning what nuts come from which trees and how to identify them. Some of the bucket upon bucket full of acorns we have collected will be ground into flour but other will be used to tan cow and deer hides in later this fall. 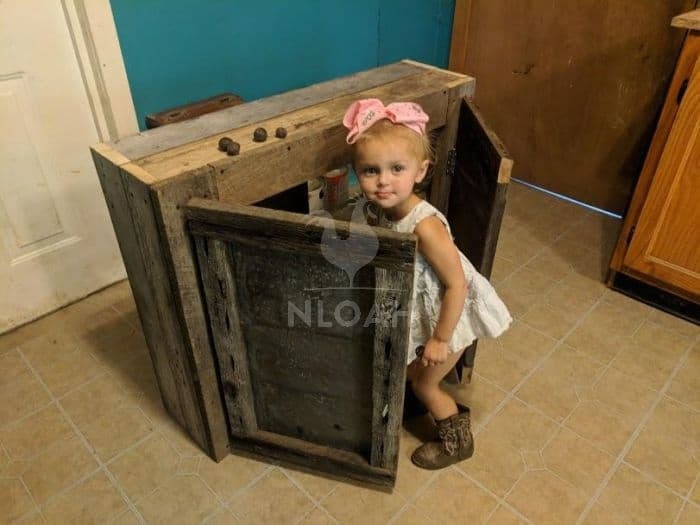 My granddaughter, Auddie, thought my old barnwood cabinet was a great place to sort and store all of the nuts she filled her pockets and little bag with while out hunting for them in our woods. Turning our austere hunting lodge into a real home is finally in high gear. The first several years on the homestead we were focused on bring back the land, repairing the 5-strand barb-wire fencing that encompassed all but the lower field, replacing rotted fence posts, fixing the barn, tearing down the beautiful 1800s era barn that was build over a ditch on a rock foundation that was no longer structurally sound, replaced the well pump, hot water heater – you get the picture. 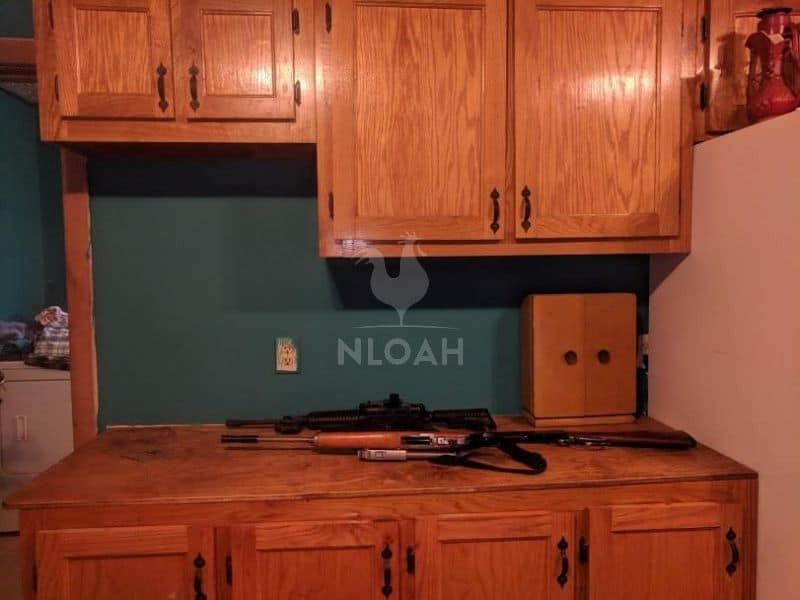 The uneven and very worn fake butcher block countertops had to go. 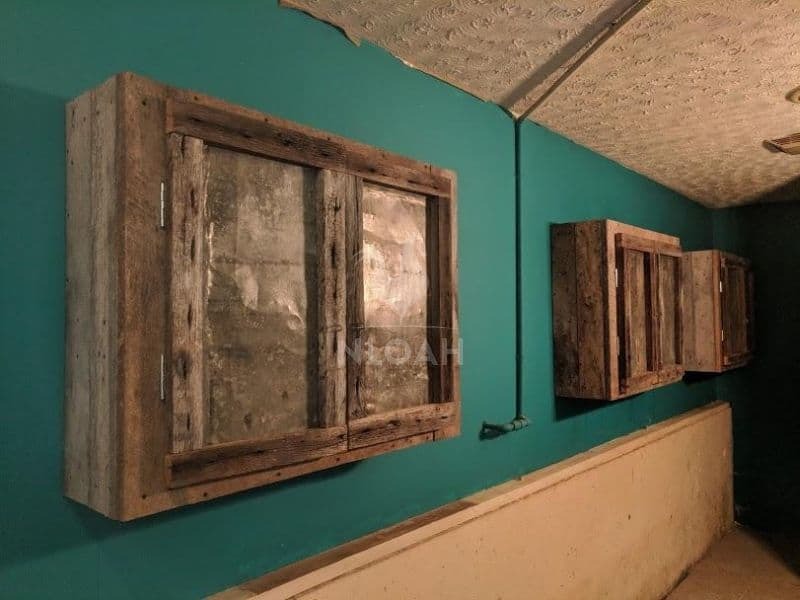 Being a frugal homesteader, I didn’t want to waste money on the project and always prefer to use rustic materials, especially if that means giving something that would usually be considered junk a new life. Barn wood will be used as paneling to cover the poured concrete lower portion of the walls in each room as well. Plywood is a vastly underrated material, in my opinion. I have seen some beautiful home decor and furniture projects on Pinterest and decided that is how I was going to make my countertops. We rounded the edges of the plywood after sanding them smooth, staining them, and adding several layers of clear coat on top. The backsplash, made out of a 1X4X8 board with a matching plywood facade, are being installed this weekend. 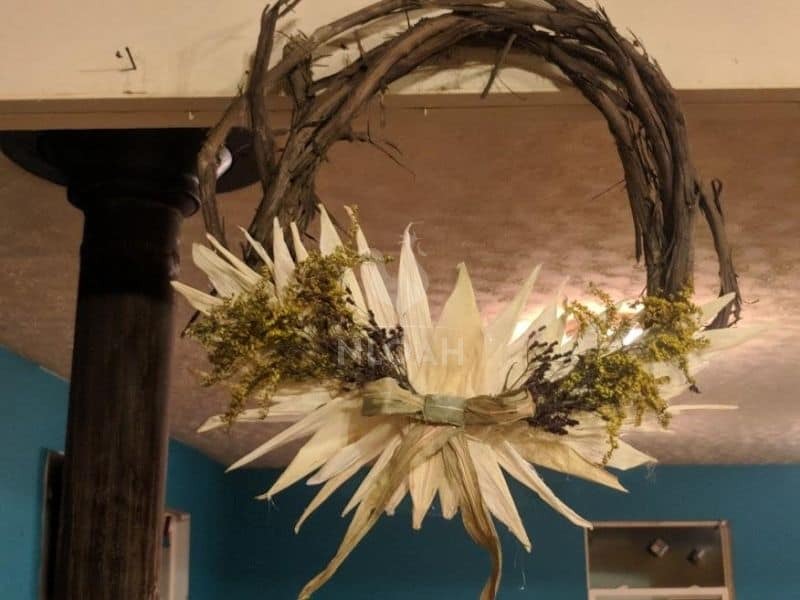 I used natural materials found on our property to make a wreath and tabletop decoration for my mother and mother-in-law as birthday presents. In the tabletop decoration I made the little fence and basket using felt and my embroidery machine, everything else in both gifts was harvest from our land. I am now deeply involved in making homemade gifts for Christmas. I love making homemade toys and the three youngest grandchildren just love them – even though they don’t make noise, light up, or have any type of high-tech components. I am learning how to make Waldorf baby dolls for the girls, making wood gnome treehouses for the boys, and turning the old white cabinet that was in the bathroom into a princess dollhouse castle. So, how was life on your homestead this month? Please share your joys, successes, and failures with the New Life On The Homestead community in the comments section below so we can all laugh, cheer, and learn more together. Good day Tara. I just finished reading through several months past of your life on your homestead. I laughed and cried and nodded my head through every month. I love reading about other homesteaders and learning from each one. We too have a homestead, altho ours is quite tiny. ( Only 5 acres) This suits us just fine since my husband ( a diabetic and heart patient) and myself (Fibromyalgia and COPD) and being in our mid 50’s, we both hold down jobs. Since we bought our homestead 13 years ago, we have been able to take it from a “Gentleman’s Farm” ( Pretty but no animals or food growing here) into a fairly well sustainable homestead. The south side of our homestead ( split with the driveway) houses the larger animals…a dairy cow, 3 sheep(for their wool) and 3 goats(for milk and if needed, meat). We also have a very small pond that eventually we will have to dig out deeper so it can sustain life of catfish, bluegill and a few grass carp. This side also has our “summer garden” where we grow vegetables that need all summer to produce, and a fairly large strawberry patch( 20 x 60) and persimmon trees. The North side of the property we have our poultry, chickens,Ducks, and geese and the rabbits. Also on our small homestead we have added 3 apple trees, 2 peach, a grape harbor, a thornless blackberry run and this year we added 2 fig trees. We also have our spring/fall garden where we grow short term vegetables like radishes,leafy greens, onions etc. I am hoping next year to add Hickory to our 1 1/2 acre wood lot as well as Almonds. We have Elderberries growing wild in several places which I use for cough syrup, wine and jelly. We are almost finished planting, ( just need the nut trees) then we just focus on maintaining it all and hopefully adding solar and wind power to the home and outbuildings. Thank you for creating your blog and I hope it inspires more families to start their own homesteading legacy. It has inspired me to get back to my own blog, and try once again to keep up with it.